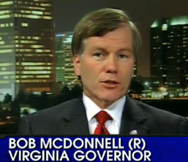 It has only been 6 months since Virginia Governor Rob McDonnell has taken office, and he has already been able to take a $1.8 billion deficit and turn it into a $200 million surplus. As Virginia's first Republican governor in nearly a decade, Democrats should take note of McDonnell's successful conservative tactics. Gov. McDonnell did not have to raise taxes, and instead put into play the use of a simple formula: cut spending, reduce budget estimates to a realistic amount, and don't spend more than the state takes in.